Lorraine Hansberry’s groundbreaking family drama is the first play in our American Legacy series. Dedicated to modern classics that lend historical perspective to stories from our past, this series seeks to draw a connection between our culture’s history and the events of today. CRANSTON CUMBERBATCH (Bobo) is an award winning singer, actor, writer, director, producer, and U.S. Talent Olympic Medalist. In 2010, he won a Michael and LARY Award for best actor in a musical for his role in SMOKEY JOES CAFE and was nominated for a STAR and Jeff Norton Award for his roles as Jim in BIG RIVER (8 O’Clock Theatre), and as Benny in RENT (American Stage). Other stage credits include: Wolf in August Wilson’s TWO TRAINS RUNNING (American Stage); Malcolm in an adaptation of William Shakespeare’s MACBETH (Studio@620). Film credits include: If You Only Knew, Loaded Love, Loved, King Charles, No Harm Done, The Serious Student, Nothing Else Matters, Love & Context, and his most recent film, Art in the City. Cranstan currently serves as the Performing Arts Director for Pinellas County Job Corp and is the acting instructor with A.C.T. He is the CEO and Producing Director of his own entertainment company- AmaznCran’s Creative Works Inc.
FANNI GREEN* (Lena Younger) was last seen in American Stage’s JOE TURNER’S COME AND GONE. A St. Petersburg native, and member of the Theatre faculty at the University of South Florida (Tampa), she teaches acting, voice/speech/dialects, and directs. Stage credits include: Broadway’s MULE BONE, Off Broadway (NY Shakespeare Festival, NY Theatre Workshop, and Ensemble Studio Theatre). Regional: STEEL MAGNOLIAS (American Stage); YELLOWMAN (Jobsite Theatre), Film/Television credits include: THE OBJECT OF MY AFFECTION; DRUNKS; LAW AND ORDER.. Additional credits: Your Real Stories: DECADES OF WORK, ‘SAY WHAT’ play-reading series at the Studio @620; (director) IN THE BLOOD ;(dialect coach) Voodoo Macbeth) for Stageworks and the Studio @620, respectively. For USF Theatre she’s directed TROJAN WOMEN, WHAT THE HEART REMEMBERS (which she wrote), IN THE NEXT ROOM, THE ROAD WEEPS, THE WELL RUNS DRY, and GIDION’S KNOT. She and husband Gary Lemons have two kids, a nephew-son, and four grandchildren. GAVIN HAWK* (Karl Lindner) was most recently seen as Robert Lyon in THE PITMEN PAINTERS at American Stage. Other Tampa Bay credits include THE FOREIGNER, ART, and BAREFOOT IN THE PARK (American Stage); and DR. JEKYLL AND MR. HYDE (freeFall Theatre). American Stage audiences might also know him as one half of the long-form improvisation duo HAWK AND WAYNE, now performing their latest show, KARAOKE-PROV, every first Sunday in the American Stage lobby. Gavin is a Professor of Theatre at Eckerd College, and earned his Diploma in Acting at The Juilliard School and his M.F.A. in Acting/Directing at California State University, Long Beach. He is a proud member of the Actors’ Equity Association. Special thanks to Eckerd College and the American Stage team for their continuing encouragement of his artistic endeavors, and his wonderful wife Peyton and his two amazing children for their love and support. JAIDEN GRAY (Travis Younger) was most recently seen as Blakely in the 2018 Charles Dicken’s play A CHRISTMAS CAROL at the Straz Center for the Performing Arts, and will be featured as a supporting actor in the 2018 Disney’s PETER PAN at the Straz. ELIJAH JORDAN (Travis Younger) has no previous stage performances. He has attended American Stages summer program for the past two years. ENOCH KING* (Walter Younger) is an Atlanta native and excited to be a part of this amazing production. Recent credits include: THE CHRISTIANS (Actor’s Express); A LESSON BEFORE DYING (Dominion Entertainment); THE COMEDY OF ERRORS and CANTERBURY TALES (Shakespeare Tavern); CONSTELLATIONS (Horizon Theatre). Film/TV credits include: Kevin(Probably) Saves The World; Party Boat; I Had A Dream; Ir/Reconcilable; Let’s Stay Together; The Watsons Go To Birmingham; Becky and Barry; Edgar Allan Poe’s Mystery Theatre; The Fighting Temptations; and Drumline. Last summer, he had the honor to play Emmett Till in ANNE AND EMMETT at the National Museum of African American History and Culture in DC. Giving thanks to GOD, my family, and friends for all their love and support. TROY D. WALLACE (George Murchison) was most recently seen as Sonny in IN THE HEIGHTS at Westcoast Black Theatre. Other credits include: THE WIZ (Western Michigan University); SIDESHOW (Kalamazoo Civic Theatre); SHOWBOAT (Western Michigan University) He has a B.F.A in Musical Theatre Performance from Western Michigan University. Special thanks to his family and loved ones for their unending support. The perfect primer! 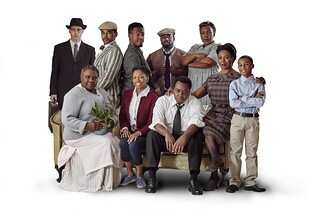 Take a peek behind the curtain before the opening of A RAISIN IN THE SUN with this informative and entertaining presentation about the play, the playwright, and the American Stage artists who bring it all to life. Professor Emerita Dedee Aleccia will provide relevant details about the history and central themes of the play, while members of the artistic team will give an insider’s perspective on their process. 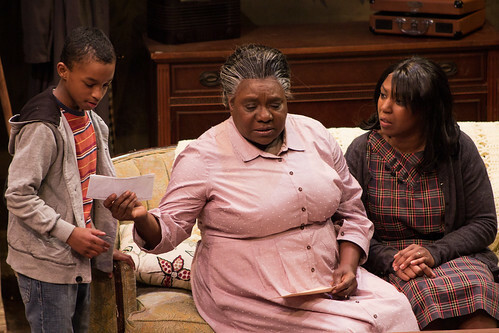 A RAISIN IN THE SUN asks us to reflect on the history of integration in our country, the progress of our communities, and the American Dream. What does integration look like today in St Petersburg? Hear from local leaders who can speak to their vision and efforts toward diversity and progress. *The chatback scheduled for 2/11 has been changed to a Community Conversation moderated by cast member, Patrick A. Jackson following the performance at 6PM.